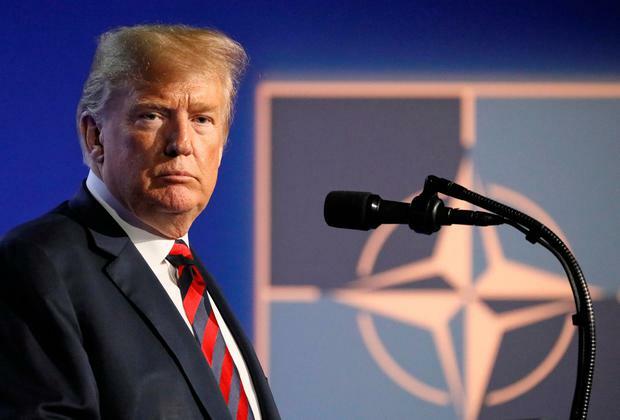 Donald Trump has proclaimed victory in his battle to get Nato allies to contribute more to the costs of collective defence at the end of a stormy summit of alliance leaders. Following an emergency session at the alliance headquarters in Brussels, the US president said the other members have agreed an unprecedented increase in defence spending. However, there were few specific details, while French President Emmanuel Macron immediately disputed his suggestion they had agreed in future to go beyond the existing Nato target to spend 2pc of GDP on defence. Mr Trump, who on Wednesday singled out Germany in a blistering attack on its record, said he had made clear in yesterday's emergency session he was "extremely unhappy" with what had been on the table. Nato Secretary General Jens Stoltenberg confirmed there had been a "frank and open" discussion, but Mr Macron denied reports the president had threatened to pull out of the 69-year-old Western alliance if he did not get his way. "President Trump never at any moment, either in public or in private, threatened to withdraw from Nato," he said. Earlier, British Foreign Secretary Jeremy Hunt backed Mr Trump's demands for allies which were not hitting the 2pc target to do more. "We think President Trump is basically right that the foundation of a successful alliance is fair contributions by all parties," he said. "Britain is one of a minority of Nato countries that does spend 2pc, but for Nato to be sustainable and successful going forward, all countries need to step up to the plate." Mr Trump insisted he had always been a strong supporter of Nato, but had made clear his deep dissatisfaction with the way it was operating. Mr Trump did not go into details about what specific countries had promised but suggested they would be increasing their rates of spending "at a much faster clip". "Some are at 2pc, others have agreed definitely to go to 2pc, and some are going back to get the approval, and which they will get, to go to 2pc," he said. Mr Stoltenberg said the president had injected a "new sense of urgency" into the discussions on "burden-sharing". But when pressed on the figures, he referred only to the $40bn (€34.2bn) in increased spending which allies had promised the alliance since Mr Trump became president. The emergency session was called followed a morning meeting between Nato leaders and the leaders of Ukraine and Georgia, amid claims Mr Trump demanded non-Nato members leave the room.